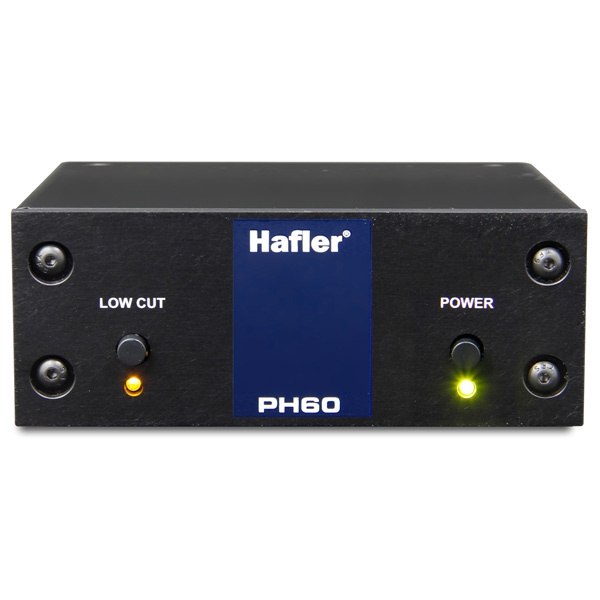 The Hafler PH60 is a high performance phono stage for moving coil cartridges that combines a 100% discrete class-A transformerless head-amp design with a well defined RIAA curve to preserve and transmit the original program material with minimal coloration. Due to the extremely low signal level produced by moving coils, particular attention has been applied to reducing noise while retaining the purity of the signal path. The design begins with a 14-gauge steel casing to shield the low level signals from external magnetic fields and RF contamination. Gold-plated input and output RCA connector pairs are employed that will not tarnish over time, thus optimizing signal flow. 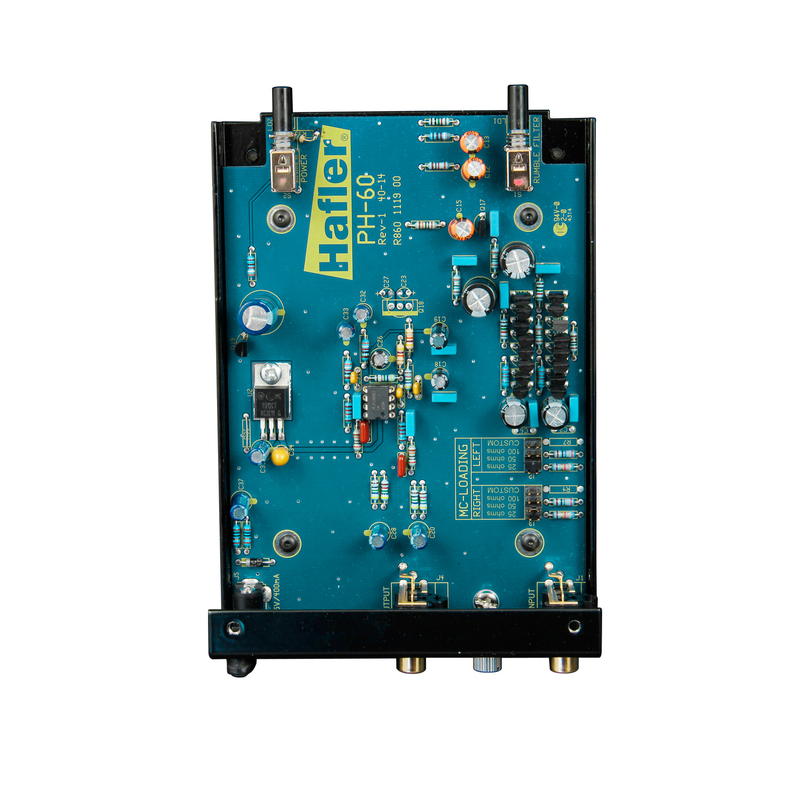 Inside, the solid-state circuit and military grade PC board have been optimized by carefully positioning parts for minimal self-noise and cross-talk and then supplemented with a ground plane to reduce susceptibility to RF. An external supply further reduces noise by removing the power transformer from inside the casing. 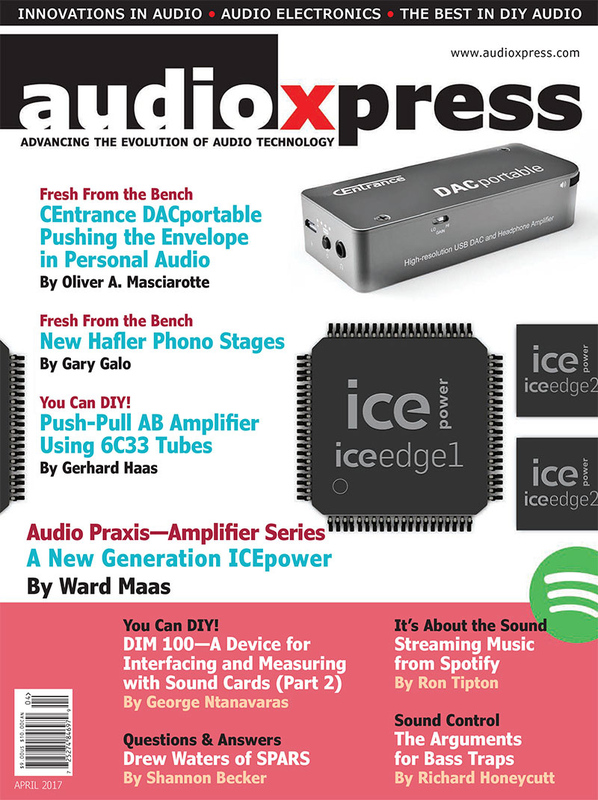 Inside, a series of jumpers enable the user to match the impedance of the cartridge with the PH60 to maximize the frequency response and reduce distortion. These are set during hookup and can be changed later should one decide to change to a new moving coil cartridge. Front panel controls include a power on-off switch and a low-cut filter that may be inserted into the signal path when needed. 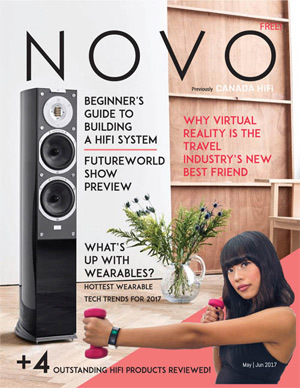 This enables the user to reduce low frequencies that can cause resonance and feedback when playing music at higher levels. This helps eliminate both airborne and solidly coupled transmission of vibrations that can enter the stylus and cause feedback, rumble and distortion. 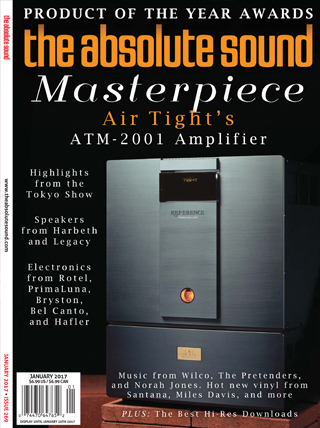 Compact and ‘plug and play’ easy to use, the PH60 follows Hafler’s 50 year tradition of building the very finest audio products for the most demanding high fidelity enthusiasts. Connects from the turntable to the PH60. Shipped with 100 ohm input load for moving coil cartridges. Gold plated to eliminate tarnishing and ensure optimal signal transfer. Connection for the external 15V power supply. Features cable lock for added security. The power supply is included. 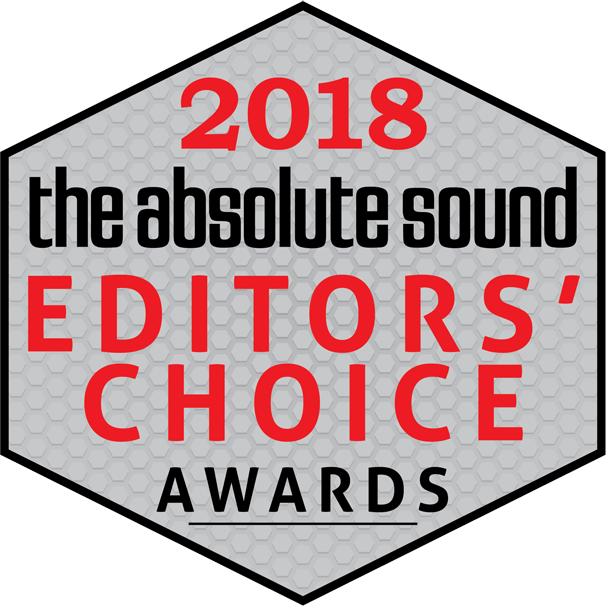 The all-important moving coil input section features a 100% discrete class-A circuit for the most demanding audiophile to deliver an exceptionally linear response. 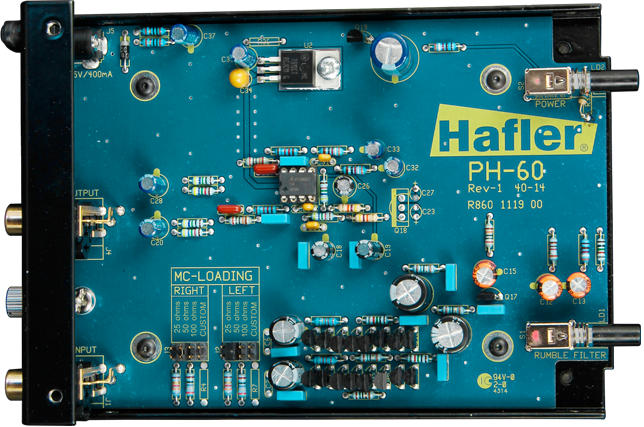 To optimize signal transfer, the PH60 employs metal-film resistors along with full-sized capacitors that are hand inserted to deliver low noise and plenty of drive. 25, 50, 100 Ohm or custom load to set for your cartridge. Made from virgin steel, the folded U-shape design provides a solid frame for the sensitive PC board to eliminate torque, which could lead to premature cold solder joints. Also provides excellent shielding against RF and tray magnetic fields. The PH60 comes factory set at 100Ω as this will accommodate about 90% of the cartridges used today. Your phono cartridge manufacturer will suggest the appropriate load for its cartridge for optimal performance – which should be found in the cartridge’s manual or web site. If your cartridge requires a different load, simply take the cover off the PH60 and carefully pull the jumper from the 100Ω position and push it back on to the 50Ω or 25Ω position to suit. Setting the load correctly will assure the most accurate frequency response. Some cartridge manufacturers may suggest a unique (specific) load to optimize their cartridge’s performance. To address this, a fourth ‘custom’ position in the jumper section of the PCB allows a resistor to be soldered in to suit. 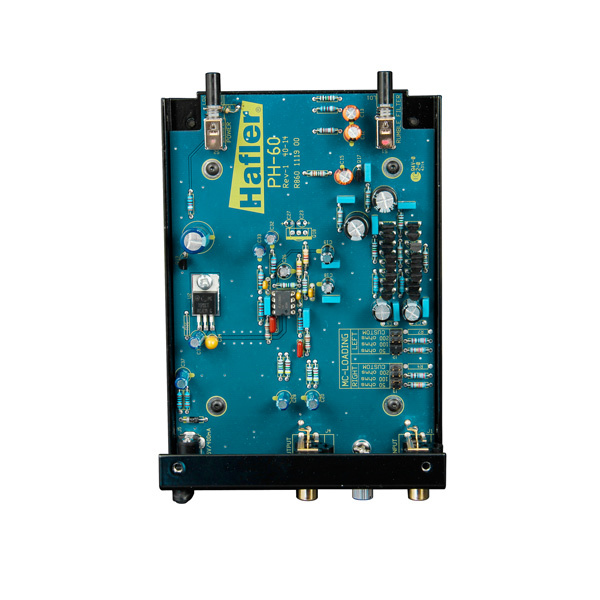 Simply have your dealer contact the Hafler service department with the required load and we will calculate the proper resistor. Your dealer’s service department can then insert the part at a nominal cost to accommodate your needs. Can I connect a moving magnet (dynamic) cartridge to the PH60? No. 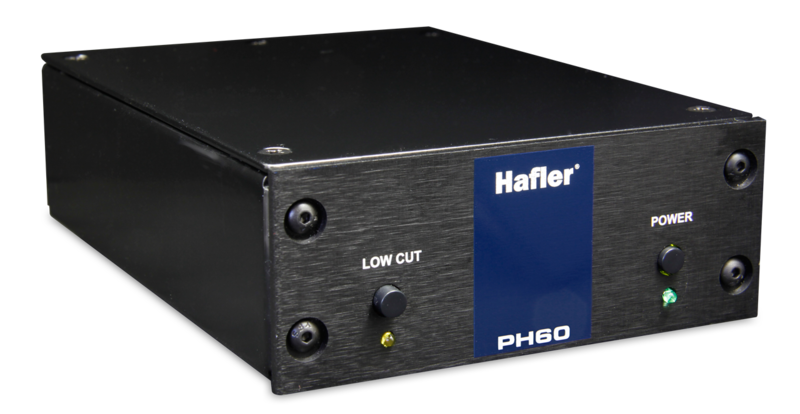 The PH60 is designed for moving coil (dynamic) cartridges. For moving magnet designs, the Hafler PH50 is the proper choice. 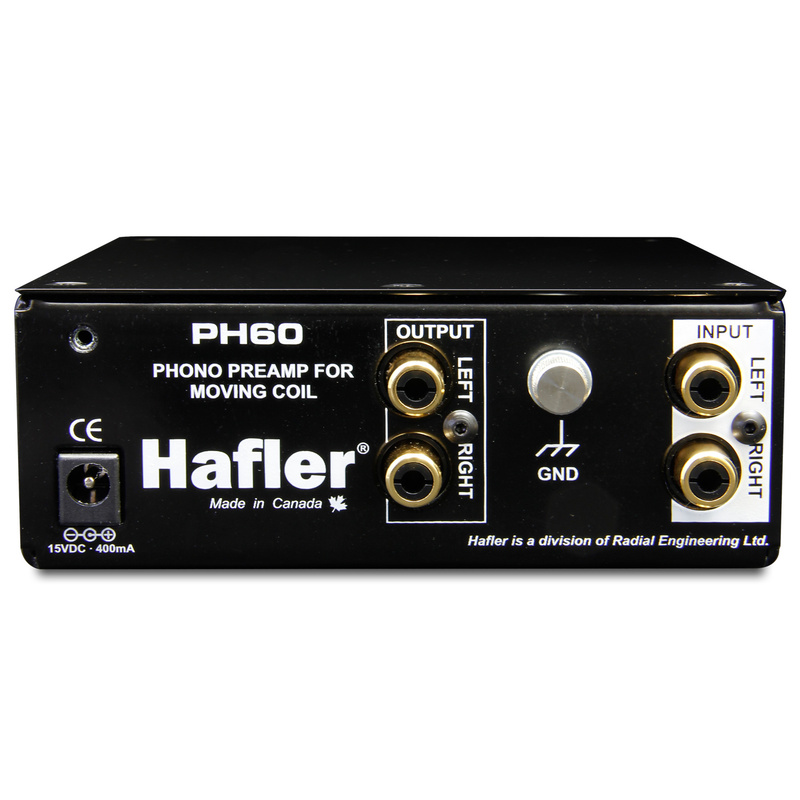 Can I connect the PH60 to the phono input on my stage? No. 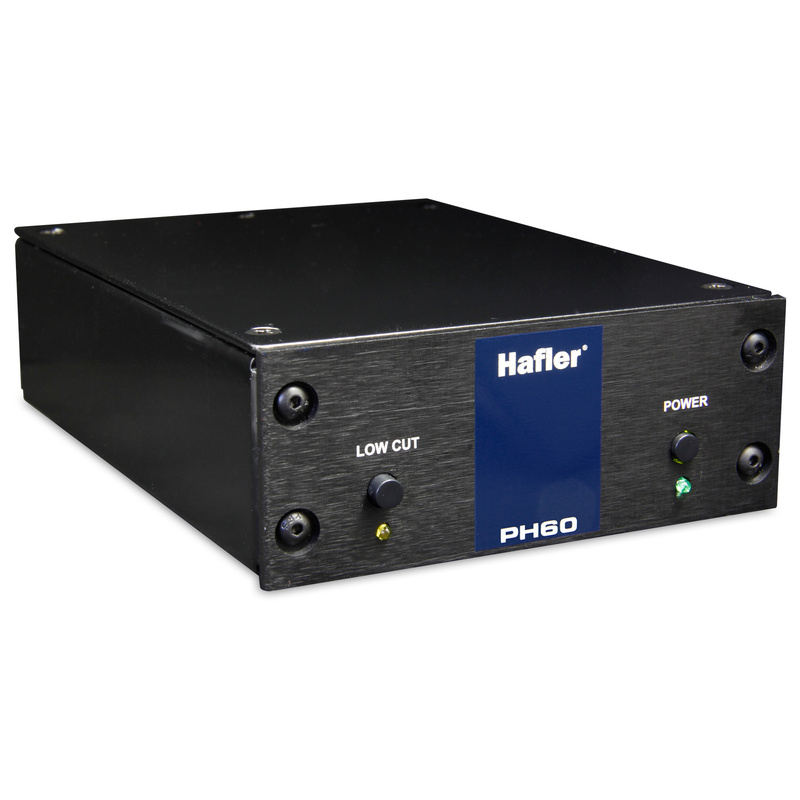 Your phono stage is equipped with an RIAA equalization curve, as is the PH60. 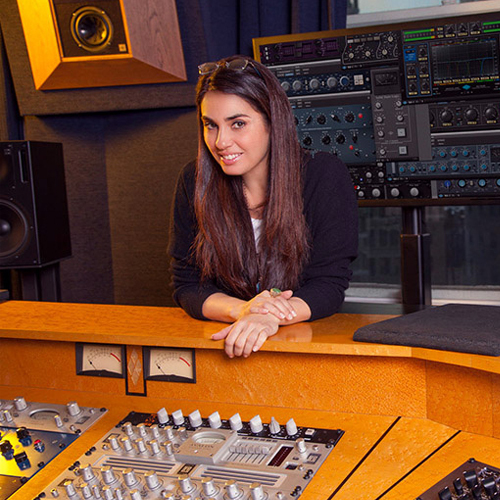 Using two of these EQ's in series would seriously degrade the sound and the signal would likely be distorted due to the level mismatch. Can I bypass the RIAA equalization curve inside the PH50? High impedance cables are generally more prone to picking up noise from radio frequencies and magnetic fields. Thus keeping the cables shorter is beneficial. As a rule, try to keep the output cables from the PH60 under 2 meters (6‘) in length. 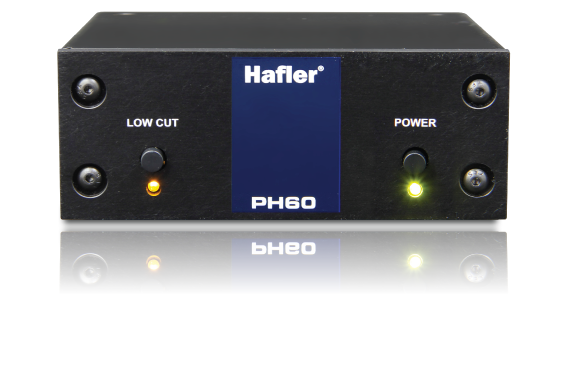 Why does the Hafler PH60 employ an external power supply? The PH60 reproduced the unstoppable rhythm and groove of these tracks with a musicality and coherency that was a joy to listen to. The PH60 made my records sound like music, rather than recordings. Compared to solid state digital gear in this price range, which usually delivers horribly fatiguing noise, this was a pleasant surprise. The PH60 represents a solid choice for vinyl lovers in the market for a smartly engineered, well-made and affordable phonostage. 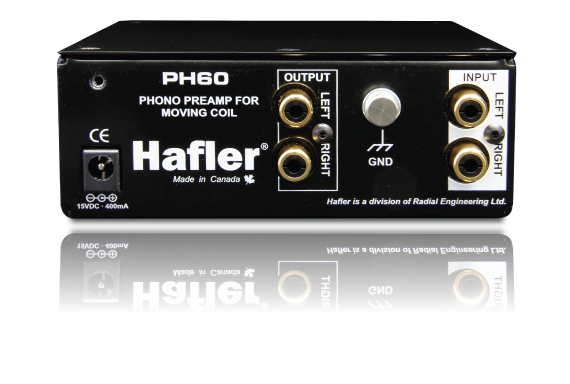 The performance of the PH60 was impressive, especially considering its reasonable price... building a clean, quiet preamp to match the gain requirements of very-low output cartridges is a challenge for any designer, especially in this price range. Hafler has certainly succeeded with the PH60."